When products are available on T.V. such as an adhesive like the 5 Second Fix or another household tool, it’s hard to know it’s worth, let alone the series of payments you pay to get it shipped. It’s easy to dismiss these products or get into spending your hard earned money on an inferior item. As a determined, smart consumer who is not to get ripped off. You’re taking the proactive step of reading reviews before wasting money on anything. You’re looking for authentic reviews from users to know what it’s like using the items on a daily basis. Unless you are willing to risk money, the reports are ways to tell if the product is worth it. We gathered thoughts and insights from reliable sources on the internet in which people who tried 5 Second Fix gave their feedback. We hope it can help you understand if this product suits your needs. What is the 5 Second Fix? You probably saw the ad in passing but the 5 Second Fix is an “as seen on T.V.” product from OnTel Product Corporation. This quick fix is a liquid-plastic welding tool. This compound becomes solid when exposed to UV light. Ontel Products Corporation claims that 5 Second Fix can seal and fix any material such as plastic, glass, wood, metal, ceramic, and stone. First of all, it’s understood to question the validity of OnTel since the claims assert such fantastic possibilities. Let's take a more in-depth look at what this product claims to be. What does the 5 Second Fix do? Two separate pieces of wood, whether it’s reattaching the leg to a desk or putting a napkin holder back together. Repair a broken plastic item. It could be a toy, a fractured panel from a television, or the handle from a plastic bin. The 5 Second Fix claims it can be the product to fix it. Metal lamp or fan has worn out with age. Broken glass ornament. The 5 Second Fix is perfect for fusing together glass objects without any signs of ugly mars. Treasure ceramic statues and bowls should be repairable with the 5 Second Fix. The 5 Second Fix could repair a torn curtain or favorite shirt. If you’ve got a broken piece, the makers of the 5 Second Fix says their product can repair it. And, if it's true, therefore you'd save a lot of money from repairing rather than replacing them. OnTel claims that 5 Second Fix works better than any ordinary glues you could find at your local hardware store. It is the permanent fix for almost any material that needs repair. It can fill cracks and stop leaks. Not only that can handle it bond and fix various materials together, but it is also sandable, paintable, and flexible. If the product does all that it claims to do, then this is an essential low-budget tool you can add to your toolkit. It can work on almost all materials; therefore, it's the only quick-bonding agent you will ever need. The ultraviolet light activates this compound and comes with a rod attached to the other end of the tool. This unique and novel curing allows the consumer to reposition the item as often as needed before bonding the objects. If you have used Super Glue and had your fingers stuck together by accident, you understand how this built-in safety feature would be appealing. Ultraviolet light at the other end of the rod. Once you positioned the pieces for repair, it uses ultraviolet light to bond the 5 Second Fix together. A full set of batteries to power the UV light in the repair wand. What are People Saying About the 5 Second Fix? Real, unpaid-to-review consumers verified users from Amazon, Bed, Bath & Beyond, and other sites have given tons of reviews online. As a result, there were mixed reviews, and it seems to split in the middle for 5 Second Fix. There is no clear consensus on the reliability of the 5 Second Fix because there is a mixed reaction from the consumers who purchased and used it. Even with this split decision, the reader can still see the pros and cons for them, thus help them decide if this is a product worthy of time and money. From Bed, Bath & Beyond buyers, there were more positive responses to 5 Second Fix. Those who used the product said that it worked well in fixing things like glasses, jewelry, and even heirlooms like glass chandeliers. From Amazon buyers, they tested the product on a wide range of items including eyeglass frames, statues, and various things. 50% of the consumer reviews gave one star, while 40% gave three stars or higher for the 5 Second Fix. There are also reviews on Amazon which reinforce the Bed, Bath & Beyond crowd. Some users experienced issues because they failed to follow the instructions. Many instances appear on one-star reviews that were unable to do the proper way of curing the material with UV light. Also, any part of the plastic welding compound will not bond without an adequate amount of UV light. Most negative comments from the review came from those who used the tool as an adhesive. Furthermore, some pointed out that any part of the compound not exposed for 15-30 seconds will never be able to bond. Since there's not much light to expose the mixture, hence opaque materials will not bond via the UV light. Therefore, to maximize the use of 5 Second Fix, apply the adhesive to the surface and use the UV light to bond transparent. Various sites have conducted tests and come up with mixed results. One source summed up what reflects the overarching conclusion about 5 Second Fix. It is excellent for specific materials but mediocre on others. The UV light can’t penetrate opaque materials like wood, dark plastic, and metal. The following true-to-life examples may give you an idea of whether the 5 Second Fix can help your current repair project or not. The site repaired a broken Martini glass. The bond remained stable, and the glass kept together. A porcelain bird that fell off from a shelf got repaired and put back together. The bond remained, and the bird stayed intact. It is necessary to apply it to the surface of the broken item to get the most of 5 Second Fix. Without this, the ultraviolet light that sets the bonding compound will not work. The projects in which 5 Second Fix worked was when they placed the adhesive on the surface and was transparent. The other projects in which the product failed was when they tried placing the compound in areas where it was not exposed to UV light. 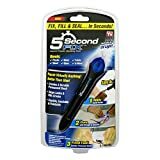 The 5 Second Fix comes with instructions to wear protective eyewear and gloves. Make sure to make any repairs in an open area. Also, you need ventilation to keep your lungs and eyes away from the mixture. The precautions of 5 Second Fix indicates that it is toxic if consumed and can cause blindness. When not used, keep the mixture out of reach from pets or children. Also, once the product welds to the item, it should be safe to handle. It is not recommended to apply the product to any food service or preparation tools or dishes. The repair of the clear stems of wine glasses. Repairing parts of eyeglass frames. The plethora of other transparent or near-transparent plastic objects that needs repairs. We believe that 5 Second Fix will work for specific ceramic materials, though not on polyvinyl acetate. For anything else, we’d recommend researching particular products; it’s better to do some study before getting this product.